I hope that I can speak for all of us in saying that the friendships we made at Queen Margaret’s have been some of the closest and most enduring that we have made throughout our lives. Earlier this year, with the 20 year mark fast approaching, we thought that it was an opportunity to go ‘back to School' and bring all our families together. Through our Facebook year group page and School leavers’ photos we managed to make a list of 75 OMs and with everyone’s help managed to track down the vast majority of them. Sadly, many were unable to make the day due to prior engagements, especially with some of the year group living in France, Switzerland, Denmark, US, New Zealand, Hong Kong and Spain. 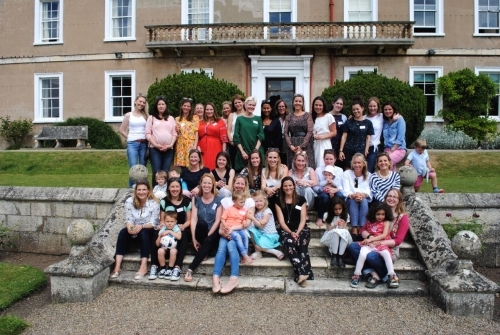 However, on a fabulous sunny day on 9 June, 31 old girls met at QM, bringing with us 10 husbands and 33 children, ages ranging from six months to nine years old. We were greeted at the main front door and taken down past the Head’s door to the bottom of Red Stairs (which we were never allowed to go up and down in our day). Having brought picnics and rugs, we took over the lawn in front of The Wenlock Library, catching up whilst the children (and husbands) enjoyed the amazing grounds. Some LVI girls gave us a tour of the School - it was wonderful to reminisce about our early days in Red House, remembering that Sports Hall smell at examination time and aerobics with Mrs Chapman. We were all in awe of all the amazing new facilities and loved showing our families round. It was a fabulous day which was over far too quickly.